Ecuador provided us with one of our most pleasant and unexpected encounters at the Tribunal Constitutional. We hadn't had much time to plan a visit to the Ecuadorian courts, as the idea to visit various supreme courts popped into my head a few days before we were leaving for Peru. In what would become my standard operating procedure for this project, we looked up some online background information on Ecuador's court system, found the addresses of the courts, and--in the absence of any tourist information--dressed fairly nicely and headed out to see what reception we would get. In places like Ecuador, this worked out better than expected. In other countries, I ended up being menaced by men with guns or indirectly bothering an attorney general. But I'm getting ahead of myself. Ecuador set my parameters for this project, both in where I would go and what I'd try to achieve. 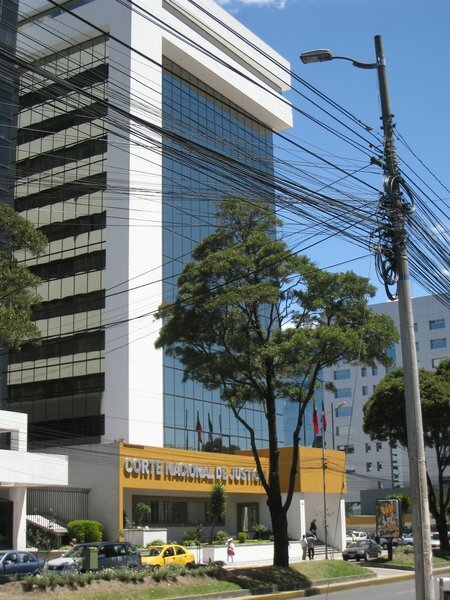 Like many countries, Ecuador has separated the court that functions as the highest appellate body (the Corte Suprema or Corte Nacional) and the body charged with interpreting the Ecuadorian constitution (the Corte Constitucional del Ecuador para el Periodo de Transicion). In every country, I tried to visit both the constitutional court and the highest appellate court. Yet merely finding the Ecuadorian courts, let alone trying to understand them, proved difficult. We didn't always have internet access, and when we did, the Ecuadorian court websites seemed to be frequently offline. Pallavi's Spanish is better than my "donde esta el bano?" level, but neither of us is up to doing legal research in the native tongue. I quickly figured out that there was little way to conduct in-depth research for the Supreme Court Project, especially once we entered Asia or Africa and I had even less grasp of the language. So while I hope that these entries will be entertaining, and I'll do my best to provide links to useful sources of information, the Supreme Court Project is more a short excursion into gonzo journalism than a legal project. In other words, This Is Not Legal Advice (and for goodness sake, don't cite to it). With that in mind, here's my tale of the high courts of Ecuador. Continue reading The Supreme Court Project: Ecuador (August 30, 2010). Wonder if this is worth a room upgrade? TripAdvisor offered to send us a free "Top Contributor" tote bag. I don't normally use tote bags, but it might be funny to see the reaction of hotel staff if we walked in carrying one.